The Seat Ateca is called the first SUV from Spain, but technically that is not correct. Yes, the Ateca is the first SUV from Seat, but is manufactured in the Czech Republic, in the factories of Skoda. Since it is a production from the Volkswagen Group, finding replacement parts for these cars is not difficult. Also the windscreen replacement of a Seat Ateca can be done cheaply, thanks to the wide after market where more than enough parts can be found for all Seat models, including the first SUV of the Spanish brand. How can you save on costs when replacing the windscreen of your Seat Ateca, and how popular is this model in the Netherlands? it was feared that it would be a copy of the Volkswagen Tiguan, the Skoda Kodiaq or the own Seat Leon, all built on the same platform. But the Spaniards made sure that the Ateca got its own face. Or actually seven faces at this moment. Ateca FR Business Intense: FR version with cordless phone charger. What makes the Seat Ateca special? The Seat Ateca is in many ways a special car. That it has become 'the driving school car of the year' in the Netherlands, is slightly striking since it is an SUV. An SUV with a limited engine in the standard version: a 1.0 three-cylinder which does well on relatively flat roads but which has considerably more trouble in hilly areas. That is remarkable, because this SUV is made to be fully loaded. No less than 510 litres of luggage space when the back seat is up and a respectable 1600 litres with the back seats down. The SUV is standard front wheel driven but is optionally available with four wheel drive that turns on when needed. The virtual dashboard and the tinted rear windows are a nice extension of the assortment of features at Seat, but the most interesting features are mainly found in the more extensive models and also the nice options can be found there. Such as a wireless phone charger, multimedia system, all-round parking sensors and special LED lights on the car. The basic version, the Seat Ateca Reference, is a boring laggard where especially plastic is used to fill up the space where the features can be added when you want to put more money for your Seat SUV. How popular is the Seat Ateca? When you look at the sales figures in the Netherlands, for example, you can clearly see that the SUV of Seat is very popular. Less than 2,000 copies of the Seat Exeo were sold, the Seat Arona did a little better with just over 2,000 models. The Ateca already scores better. More than 3,500 models were sold in 2016-2018. This is far from comparable to the success of the Seat Ibiza, which sold more than 140,000 models, but the Ateca is in a completely different market segment. It hasn't been a thrilling success, but the Seat Ateca is one of the models that has been very well received and with that Seat seems to be on the right track. Especially when it pays a little more attention to the basic version of the SUV in the future. If the windscreen replacement of your Seat Ateca is required, it is important to look at the functions of the windscreen itself. A windscreen of a Seat Ateca is in most cases equipped with a rain sensor and can be equipped with a camera. This means that it goes a bit further than just looking at the costs of a new windscreen. If the windscreen of your Seat Ateca is not replaced properly and is not calibrated, the Front Assist function, which automatically brakes in case of danger in front of the car, may be lost. It is therefore wise to have this done only by experts who know exactly what needs to be done to make the most of all the car's functions. When should you replace the windscreen of the Seat Ateca? In the case of an asterisk, windscreen repair is still possible. If it is more than an asterisk, then the windscreen replacement of the Seat Ateca is a wise choice. In newer cars like the Seat Ateca, the windscreen is much more than just glass. All these functions are important for safety and comfort. Can the windscreen of a Seat Ateca be replaced cheaply? Cheap car window replacement seems difficult when it comes to newer car models. Yet cheap replacement of the windscreen of a Seat Ateca is certainly possible. When using after market automotive glass, the costs are much lower than when using branded automotive glass. This has only to do with the brand logo on the window itself: there are no other differences. The windscreens for the Seat Ateca with and without the brand logo are made in exactly the same way and in most cases even in the same factories. If you choose an after market windscreen for your Seat Ateca, you choose the best value for money. When ordering the Seat Ateca windscreen from us, you can choose whether you want to order the windscreen with or without installation. If desired, you can order only the windscreen without us having it installed. 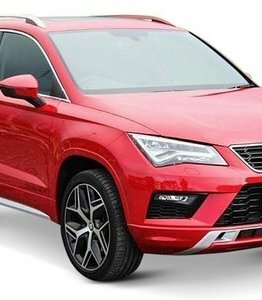 Can I replace my Seat Ateca windscreen myself? If you do not have any equipment to calibrate, you cannot replace the Seat Ateca windscreen with camera yourself. After replacing the windscreen, the camera often needs to be reconfigured so that the camera in the windscreen communicates optimally with the equipment connected to it. Can we do the windscreen replacement of your Seat Ateca for you? Your Seat Ateca is in good hands with us. When ordering you can indicate that you want to order the windscreen including installation. Our FOCWA-certified partners will visit you within three working days to replace the windscreen, of course with guarantee. This way you can be sure that you can enjoy your SUV to the fullest again while driving.